The French Villard de Honnecourt is an enigmatic and power-minded medieval person, considered by some people as a precursor of the great Leonardo da Vinci (in 1859 Prosper Mérimée compared Villard to Leonardo for his multiplicity of interests). Very few is known now about him (he pictured himself as a soldier and a master builder), actually he is known only through a portfolio of 33 parchment leaves (we don't know how many leaves are missing from this batch), containing approximately 250 drawings, preserved in Bibliothèque Nationale, Paris. There is no record of him in any known other document. We are not sure even what exactly his name was, because in his manuscripts are given 2 names—Wilars dehonecort and Vilars de Honecourt. Some historians suppose that he was born in the village of Honnecourt-sur-l'Escault (Nord), south of Cambrai, in Picardy, northern France, not only due to the resemblance of names, but also because the language, which he used in his manuscripts is basically the Picard dialect of Old French. Villard's fame is due to the uniqueness of his drawings. There are some identifiable monuments in his drawings, according to them the drew date was in the first quarter of the 13th century. So probably Villard lived some time in the end of 12th and beginning of 13th century. He claimed to have been in many lands and it is clear from his drawings and inscriptions, that he has visited many French towns, as well as Switzerland and Hungary (Laon, Chartres, Lausanne, Meaux, Rheims). The subjects of Villard's drawings and inscriptions fall into several categories: architecture, animals, carpentry, geometry, masonry, surveying, etc., and what is important for this site—mechanical devices. It is unknown however, if Villard devised these machines himself, or he is describing something, that he had seen somewhere during his journeys. Among the mechanical devices Villard sketched are lifting devices, a trebuchet, a perpetual-motion machine, a water-driven saw and a number of automata. The interesting for us machines are depicted in Drawing Nr. 43 (see below). This drawing is perhaps the most dear to historians of technology. This collection of machines, including an automatic sawmill, automaton, and what has been claimed as one of the earliest illustrations of a mechanical clock escapement, have generated much interest. 2. Upper-right—an improved crossbow "...that never misses." 3. Middle-left—Escapement, "How to make an angel, keep pointing his finger toward the sun." 4. Middle-right—Hoist, "How to make the most powerful engine for lifting weights." 5. Bottom—Automaton: "How to make the eagle face the Deacon while the Gospel is being read." As you can see, all the figures are rather simplified, some kind of technical sketches, that make perfect sense to someone who is familiar with the item being drawn, but to the uninitiated may not make much sense at all. The sawmill, for example, is drawn in a strange flat perspective, presenting both a side and top view simultaneously. In the upper left corner the wavy lines indicate a stream, which turns the big spoked waterwheel. This axle then turns the center, smaller ratchet wheel with the six spikes on its rim, which is the automatic feed mechanism for the log, shown resting in four pairs of guide posts. 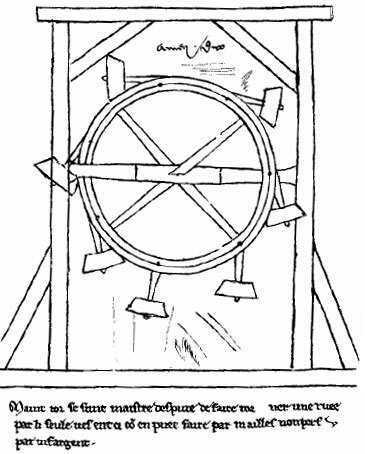 The waterwheel's axle also turns the spokes at the bottom which engage on the triangular frame at the bottom left of the illustration. As the axle turns, each spoke in turn comes down on the right leg of the frame, pushing it (together with the saw blade) down, thus cutting the wood. The saw is then lifted by the sapling pole (indicated by branch stumps along its length) back up to ready it for the next power stroke. The eagle automata at the bottom of the drawing is again a quite simplified and unclear picture of such a device. Villard de Honnecourt was one of the first scientists (certainly the first European), who described a perpetual motion machine. It is known that in 1150s the Indian mathematician and astronomer Bhaskara II devised a wheel, consisting of curved or tilted spokes partially filled with mercury. The design of Villard (see the lower drawing) was different and described the so called overbalanced wheel. 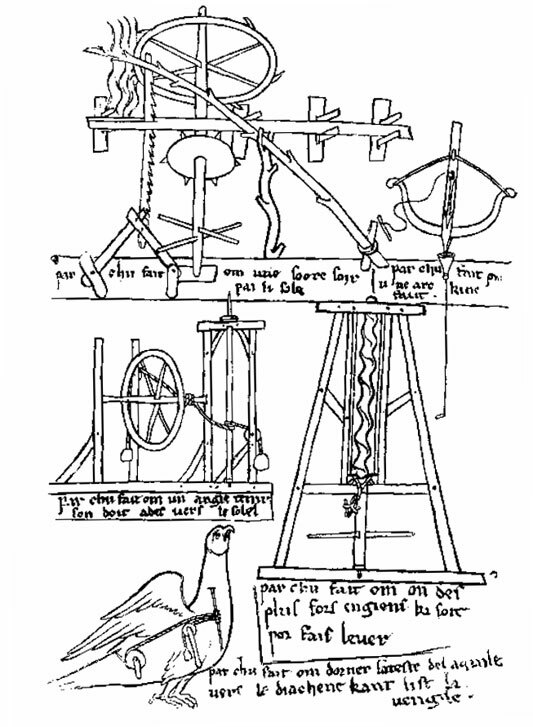 Let's mention only, that the great Leonardo da Vinci, who was generally against perpetuum mobile devices, also designed several overbalanced wheels. To my mind, Villard de Honnecourt was not as an inventor, but as a naturally intelligent and full of imagination medieval man, who saw a lot of interesting people, buildings, machines, etc. during his journeys, and decided to describe his impressions and his dreams in a manuscript, which managed to survive to our time, while many others didn't. In any case, his manuscript deserves our attention and esteem.